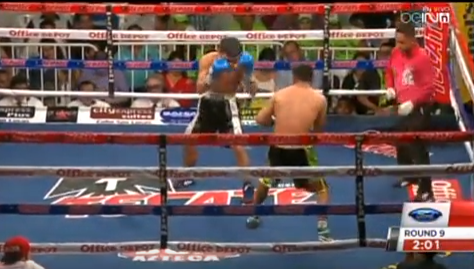 Watch the fight of the Filipino boxer Richard Pumicpic vs the Mexican Brawler Cesar Juarez. The fight happened on October 29, 2016, at Auditorio Municipal, Cabo San Lucas, Baja California Sur, Mexico. In this fight, Cesar Juarez won the fight via Unanimous Decision with the score of 95-93, 96-93, 98-91. Juarez won the first 6 rounds but the Filipino was fighting back and throwing a lot of wild punches to the Mexican, Pumicpic was dropped by Juarez before the 6th round ends. Pumicpic, however, hurts Juarez in the 8th round, Pumicpic won the last 3 rounds. This is the 2nd straight win by Cesar Jaurez against the Filipino's. Juarez defeated the highly rated prospect Albert Pagara last July 2016 by KO. Juarez currently ranked no. 9th in the world in the super bantamweight division.